Agriculture uses 38 percent of the Earth’s lands, and industrial agriculture is a leading polluter and a rapacious user of water. As population pressures increase around the globe, and the pace of conversion from forests to farmland accelerates, current farming and grazing practices will only continue to intensify the cycle of poverty experienced by most farmers, especially in and around our planet’s most sensitive and unique ecosystems. It doesn’t have to be this way. Farms are necessary, and they can also be good neighbors—by reducing their environmental footprint, safeguarding forestland and waterways, protecting wildlife, generating income for farming families, providing employment to local community members, and playing an integral part in regional conservation initiatives. And they can do all of this while still operating productively, efficiently, and profitably. The Rainforest Alliance Sustainable Agriculture Standard is used to certify farms and producer groups involved in crop and cattle production. The Rainforest Alliance’s longstanding partner, the Sustainable Agriculture Network (SAN), which owns the 2017 SAN Standard, has granted the Rainforest Alliance an exclusive and perpetual license to the 2017 SAN Standard. The standard is a rigorous set of environmental, social, and economic criteria that promote sustainability on farms around the world. Rainforest Alliance-authorized certification bodies audit farms and farm groups, and those farms that meet the certification requirements earn the right to promote their achievement and market their products using the Rainforest Alliance Certified™ seal. Our green frog seal is found on food and beverages in supermarkets, restaurants, hotels, and other businesses around the world. Our comprehensive farm-management standards and traceability system help to ensure that products or components sourced for products bearing our green frog seal can be traced back to well-managed farms and/or farm groups that protect workers, wildlife, and communities. 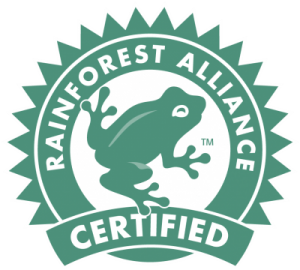 All businesses that buy, trade, or mix products from Rainforest Alliance Certified farms must achieve Chain-of-Custody certification if they wish to label their products with the green frog seal. As farmers monitor activities on their farms, implement better practices, identify problems, and assess their progress. As farmers implement soil conservation practices, such as planting on contours and maintaining ground cover. As all sources of contamination (e.g., pesticides, fertilizers, sediment, wastewater, garbage, fuels, etc.) are controlled. As farm by-products are composted and returned to the fields as natural fertilizer, while other wastes (e.g., plastics, glass, metals, etc.) are recycled whenever possible. As farmers increase production, improve crop quality, reduce worker complaints, and increase worker efficiency, while differentiating their product, improving their access to credit, and often earning premium prices. Deforestation is stopped, rivers are safeguarded by buffer zones, critical on-farm ecosystems (such as wetlands) are protected, and forest patches are preserved. As agrochemical use is strictly regulated, the most dangerous pesticides are prohibited, and farmers use mechanical and biological pest controls whenever possible. As water-conservation measures are applied in washing and packing stations, housing areas, and irrigation systems. Who receive minimum wages, housing, drinking water, sanitary facilities, and a safe workplace, while they and their families get access to schools, healthcare, transportation, and training. With the former playing an integral role in conservation strategy as they help wild flora and fauna find refuge outside of protected areas. For any questions, please contact our Certification Program team at sas@ra.org. Stay in the loop and get the most out of the little green frog—sign up today! Read previous issues.